Every now and then I have to try something new. Sunflower is one of those experiments. I've been combining fluid acrylic with watercolor for a while, but I've painted primarily on paper and occasionally on Aquabord. Sometime in the last year or so I had purchased a few canvases thinking I would apply watercolor medium to the canvas and use them for watercolor paintings. However, when looking at my canvases the other day I thought, "why bother with watercolor medium, why not just go ahead and do an acrylic painting on the canvas?". I have never done a painting in only acrylic. My freshman year in college my roommate painted in acrylic and I was amazed at how quickly acrylic paintings dry. I felt like the edges were too hard for my taste. At the time I was an oil painter used to having a wet canvas to return to the next day. Watching her work I thought, "I'll never work in acrylic". I decided if I was experimenting, then I might as well do a subject I don't generally paint in watercolor either. I reviewed my photographs of flowers and selected one of a bouquet with a large daisy. As always I played around with the cropping and coloring and created the composition you see above. 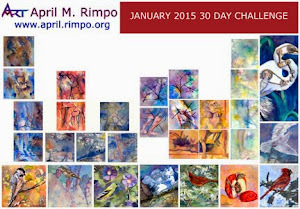 With my composition in hand, I put out small amounts of my paints and jumped in. Since the paint dries so quickly, I worked small areas wet into wet to get soft edges like watercolors and gradually moved around the canvas. I returned to areas to add very thin transparent washes as needed to either tame down the colors in the supporting cast or adding white (what a phenomenon for a watercolorist!) to areas that I wanted muted but light. I wanted the flower in the box to be lighter and more realistic in color but with some pastel blues and green highlights, while the flowers outside the box are bolder in color and include darker blue accents. Basically, I just had fun since it was an experiment, which meant no real pressure. If it came out well that would be great, if it didn't that was OK too. I think experimenting in art is important to foster new ideas in your work. 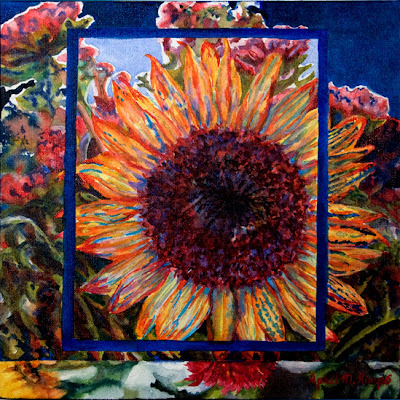 I'm not sure how often I'll work in acrylic and I don't know how often I'll include the variations of color within a single object as I did with the sunflower inside and outside the box. However, I might try it again since I now have a little practice behind me. I'd love to hear what you think about my little acrylic. Is this a direction you think I should continue to explore or just an interesting diversion? 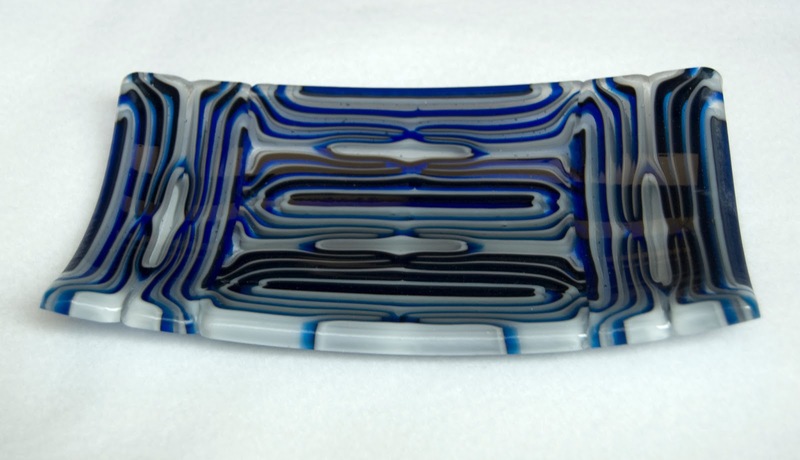 "Parentheses and Line" Glass Tray - 4 5/8" X 8 1/2"
To date my posts have been about my watermedia paintings, but today I wanted to share with you a new fused glass piece that I just completed. 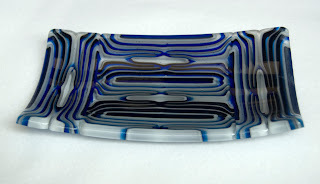 I first started as a fused glass artist in the early 1990s. I had done stained glass before, but fused glass was beginning to become popular in the United States so I thought I'd give it a try. Fused glass is created in a kiln and all except the tiniest kilns were unaffordable at the time, so I purchased a kiln with a 4" X 4" fusing space. Jewelry was about all you could do with this size kiln, which was not satisfying. So after a few years I stopped fusing glass and didn't resume until 2001 when a fusing studio opened in Beltsville, Maryland. Vitrum Studios is an amazing studio owned by two great glass artists who not only create great glass themselves but are wonderful teachers. I've grown my fused glass skills tremendously since 2001. For the last couple years I've been focusing on watercolor and fluid acrylic, but I felt it was time to start to work in my other favorite transparent medium. To rejuvenate my skills I've taken some classes at Vitrum Studios this year. This piece is composed of components I created in one of those classes. The design of the components and the final composition are my own, which is one of the wonderful things about classes at Vitrum. They teach you the skills but expect you to bring your own design sensibility and color sense to your art. "Parentheses and Lines" is a shallow tray measuring 4 5/8" X 8 1/2". 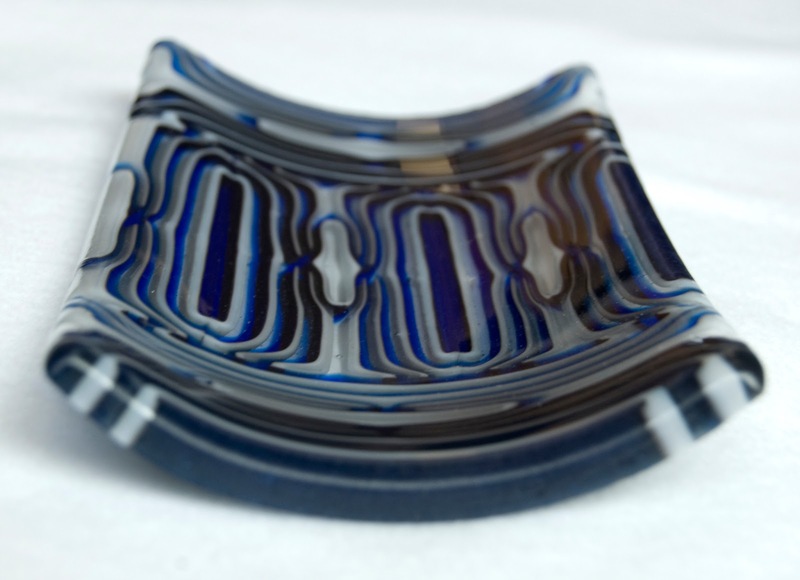 Different colors of glass have different chemical compositions and some react chemically with each other to create color shifts at the intersection. 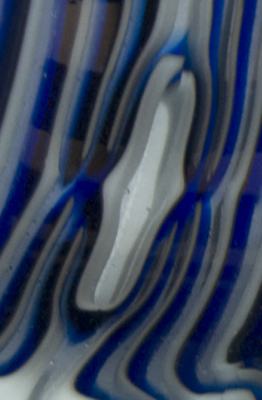 I made use of this fact in this piece, relying on the reaction between the blue and white glass to create a dark line where they abut. The line is more or less visible depending on the angle you look at the glass. In the closeup at right the serving tray bends so on the left side you can see the dark line, while on the right only a light gray line is visible. It is always a surprise when you work with glass to see if what comes out of the kiln looks like you planned or if there are any surprises. The parentheses shape was a bit of a surprise since I had expected a much more extreme dip in the glass, but I love the result. Like working in watercolor you have "happy accidents" when working in glass. Deciding what to do with the accidents is half the fun. Take a look at some of my other glass art. 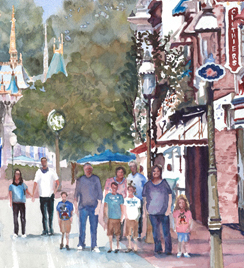 Late last fall I was commissioned to do a painting of a family's favorite vacation spot. It was a wonderful experience that I wanted to share. The person making the request knew my work and wanted me to remain true to my muse. Commission work can truly be a joy when the customer understands how important an artist's style is to the success of the painting. In fact my suggestion is to turn down a commission if the customer is not willing to let you incorporate your artist voice. We spent a little time discussing what about the place her husband loved so much. This helps me understand the focal point of the painting, what is important to them and where I can take some liberties. She knows her husband well and warned me not to exaggerate the size of the focal point because he would notice that deviation from reality. I told her I was interested in working with her on the commission and asked her to send me several photographs they had taken of the scene she described. My first step is to create a "sketch" of the painting and provide it to her along with a quote with the value of the painting for approval. I also asked her to answer three questions for me: a) which of my paintings she likes the best, b) what colors she associates with this place, and c) what is it about my work that draws her to it. The purpose of these questions is to find out what about my style of painting she likes since I do use different approaches to capture different things. I want to make sure I use the approach she enjoys the most. The question about colors is to ensure I select a color scheme that is consistent with her impression of this spot and not necessarily in the photos. She decided none of her photos really captured what she has in mind, but they were planning a trip there the next month so she would send me some shots after their return. She discussed the project with her daughters and one asked if I could capture their family in the painting. The intent was not detailed portraits but figures that represented the family in shape and size; so I agreed that was a nice addition since the location needs figures to make it believable anyway. I gave her an estimate of the approximate value of the painting, but told her I needed to work up the design before I gave her a firm quote. Upon return from their vacation she sent a dozen photographs that included a couple views down the main street, some closeups of the focal point, and some family photos to give me relative sizes of people. Since not all ten people were in a single photograph she gave me the heights of some of the people to allow me to understand relative sizes between different photos. She was the perfect customer knowing I needed this information to relate the pictures; I didn't even have to ask. Yeah! I use Photoshop® to compile various photos to create a composition. Given the focal point, which is at the end of the street, I adjusted the perspective to help me emphasize this distant spot without distorting its size. I inserted the family into the scene and I shifted colors to make it in the right direction for the colors she had suggested. I use additional Photoshop filters to help me get a look to the scene that is similar to what I do when I paint. The result is the digital "sketch" I sent to her for review along with the value of the painting, a schedule for completion, and a confirmation of how it will ship. Upon her approval she provided a 50% non-refundable down-payment and I started the painting. Upon completion I had the painting scanned because she plans to get at least one print and I emailed her an image of the completed painting. She sent the balance due and I shipped the painting along with framing instructions; she had decided to frame the painting herself. Upon receipt I received a wonderful email about how much she loved the painting. I too had loved how it came out so I was delighted with her response. The wait for his birthday to come around and hear what he thought felt endless. "WOW! That painting is fantastic! I love it! It really captures the feel of (the location). And, I knew right away who the people were once I saw them! At first I thought it was a purchased picture until I saw the family, though I'd never seen one like it before. A wonderful surprise!" At right is another segment of the painting that shows the selected color scheme of pinks and blues with some high contrast areas. This is about one third of the painting. I forgot to mention this whole process was done by email since we live a few thousand miles from each other. I think communication was key to our success. By the end of the project I really wanted to keep in touch and grow our friendship. You can read the customer's perspective on the commission check out her blog. Interested in my other blog posts regarding the business of art? You might want to check these. Learn more on my commission page. If you are interested in commissioning a piece contact April. Photoshop is registered Trademark of Adobe Systems Incorporated in the United States and/or other countries.